Subaru gives exclusive sneak peek at the 2014 Legacy sedan in a new interactive brochure. See what the new Legacy sedan is all about. Subaru is giving buyers a new way to interact with the new 2014 Legacy sedan. They have just released a new online interactive brochure for the 2014 Legacy with 23 pages to interact with the new sedan. It features tools where interested buyers can turn pages, use the tools to zoom in, bookmark pages, print all or selected pages and share it online. There are also videos for consumers to play with a live internet connection. Buyers can build their own Legacy online with the new brochure and chose between eight exterior colors to the interior color and trim. The new Legacy will come in five trim levels, 2.5i, 2.5i Premium, 2.5i Sport, 2.5i Limited and 3.6R Limited models. The 2.5i offers great fuel mileage and is powered by a standard four-cylinder Boxer engine that generates 173 horsepower and 174 lb ft of torque. The amply powered sedan when equipped with the CVT automatic gearbox gets an estimated 24/32/27 city/highway/combined mpg making it the most fuel-efficient all-wheel-drive sedans around. It features plenty of technology with an available 7-inch high-resolution touch screen and voice activated navigation system and now includes Aha connected service via Subaru Starlink system with access to web content such as podcasts, internet radio, audiobooks and personalized restaurant and hotel searches. It also comes with available HD radio, Sirius radio, Bluetooth and USB to plug in an iPod for your music. The Legacy is one of the safest sedans on the planet and has received the top rank "Five Star Award" in the 2012 Japan New Car Assessment Program (JNCAP) crash safety evaluation tests. It is also a 2013 IIHS Top Safety Pick Plus and Top Safety Pick and has been for eight years running (2006-2013). 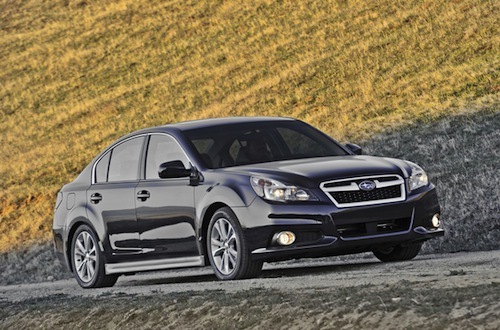 The Subaru Legacy remains the most affordable AWD sedans in America. Subaru has announced pricing on the 2014 sedan and most models will have no price increase. The 2.5i starts at $20,295. The new pricing keeps the new 2014 Legacy as the most affordable midsize all-wheel drive sedan in America. The key competitors are the 2014 Mazda Mazda6 ($21,000) and the 2014 Ford Fusion ($22,900). The 2014 Legacy remains relatively unchanged. The 2.5i Premium models include the All-Weather Package as standard, and Premium models now also have a standard audio system with a 4.3-inch screen, six speakers and SiriusXM Satellite Radio. The EyeSight driver-assist system, using stereo camera technology, is now available on both the Limited and Premium trim lines. Check out the new 2014 Subaru Legacy interactive brochure and build your own sedan. You can view the new brochure here.